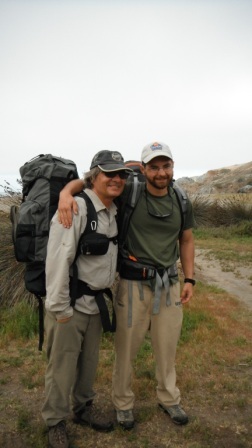 In April 2012, my Dad and I were searching for a good backpacking trip that was close to LA, and–after an epic snow year–actually open for business. Most of the Sierras were still blanketed, so we turned our attention west to Catalina. 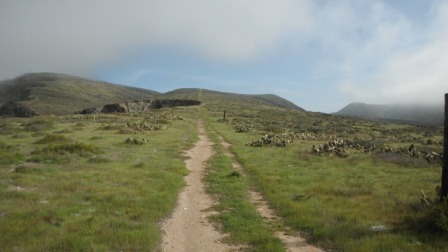 The Trans-Catalina Trail had officially opened in 2009, combining old dirt roads with some connecting trails, running 37 miles, from right outside the town of Avalon to Starlight Beach at the northwest edge of the island. The trail features steep climbs on seaside mountains, open vistas, ridgeline runs, and near constant beautiful views of the Pacific. 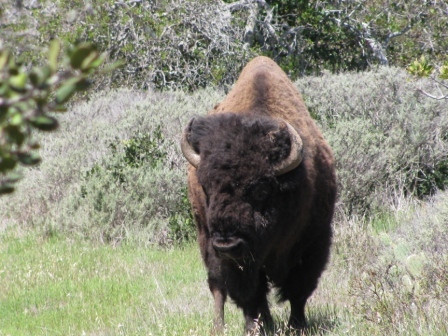 On the trail, you can encounter foxes, bald eagles, seals, and even buffalo! And, at the right time, the trail is absolutely deserted–leaving a slice of gorgeous hiking solace quiet just 30-odd miles from the giant metropolis of LA. 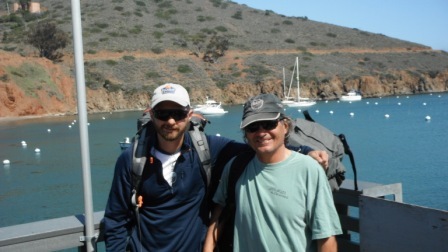 My Dad and I were lucky enough to have the time to hike the Trans-Catalina mid-week in April. 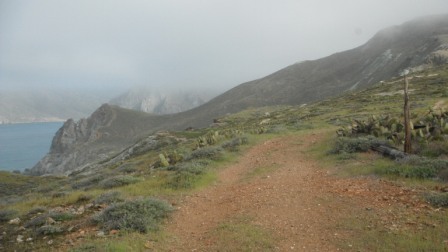 April is a wonderful time to hike the Trans-Catalina–the weather cooperates, hiking isn’t too hot, nights are cool, and wildflowers are in bloom. Plus, fewer people cross over from LA at this time, so the island feels deserted (once you leave Avalon) even at its campgrounds. We left Balboa in clouds, but soon broke out into sunshine midway across the channel. The ferry pulled into Avalon, and we could see the garibaldi swimming lazily in the clear waters. Since we had only three nights to stay in Catalina, we had opted to take a Sky Van over to Little Harbor, thereby skipping the first section of the TC. 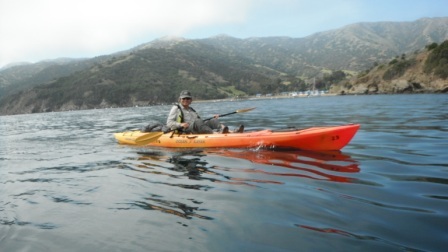 My Dad had made all the previous arrangements with the Catalina Island Conservancy, who manage the trail and the campgrounds, and generally take care of the island. We stopped by their tucked-away office in Avalon to get a map and general bearings, and then stopped into a tropical/pirate themed bar for a beer or two before hopping into the Sky Van. 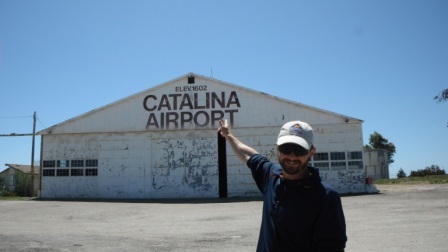 The Sky Van drove us up out of Avalon on the steep main road, and stopped for a transfer at Airport in the Sky–Catalina’s mountain-top airport. My Dad and I grabbed some lunch, and enjoyed some Sierra Nevadas, while snow-covered Mt. Baldy floated in the distance over the socked-in mainland. We hopped in a new van for the descent to Little Harbor, passing the Wrigley Family Ranch, whose owners were making an attempt at Pacific vineyard-ing. Whether the grapes turned out to make fine wines or not, the view of the trellises overlooking the crashing Pacific below made the attempt worthwhile. Not far from this wine-in-the-making, we saw our first bison, smack in the middle of the road. 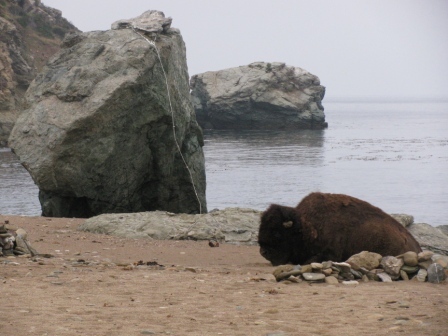 Bison were first brought to Catalina for a movie production of The Vanishing American, and when the production ran into financial difficulties, simply left on the island. At one point, the bison herd numbered almost 600, but now are more ecologically sustainable at around 150. It’s pretty enjoyable to see these hulking masses contentedly chewing away in such an incongruous setting. We arrived at Little Harbor, which was almost completely empty except for one other group of hikers. We set up in a campsite near the beach (well, they are all technically near the beach), and explored the two bays. The water was a translucent blue, and from an uplifted rock called the Whale’s Tail (for its shape) we watched some biologists and their assistants do surveys in the tide pools. Eventually the sun dipped below the western edge of the ocean, and we lit a crackling fire, drank our last beers, and listened to the waves roll onto the sand. The next day was our first hiking day, around 10 miles from Little Harbor to Two Harbors. Our patch of the island was lightly overcast, keeping the temperature cool. The funny thing about the TC is the campgrounds all located at sea level, and the abrupt ascents and descents that lead in and out of those sites. We ate a light breakfast, loaded up our backpacks, asked the only other hikers at Little Harbor to take our “before” picture, and hit the climb. The clouds kept the temps cool as we climbed, but slowly broke apart to reveal a landscape of green hills and valleys, stark cliffs dropping away into the ocean, and a red dirt trail that stuck to the ridgeline as it climbed. It was truly breathtaking, and I imagined it must look somewhat like this when hiking in Ireland or some other coastal wandering. of the isthmus of Two Harbors. Alongside this trail, a barbwire fence kept the unwary hiker from falling into the Pacific below–this fence was decorated with “barbwire art” spelling out messages and names. We could see all the way back to Little Harbor, where we had started that morning, and the larger mountains that lay between Two Harbors and Parson’s Landing. We still had one more obstacle to overcome before Two Harbors. As we descended the wide trail, we turned the corner and there, standing smack in the middle of the trail, was a massive buffalo. He looked at us, we looked at him, he snorted, we backed away. We weren’t sure what to do–he was literally right where we needed to go. On both sides of the trail was heavy brush, so it wasn’t going to be easy to get around him. Neither my Dad nor myself had much experience with buffalo, so we were wary about any large, supposedly ill-tempered animal with hooves and horns. We backtracked a bit and found a small deer trail that led above the buffalo. We were bushwhacking and probably more in danger of a snakebite when the buffalo began to lumber off the trail. We let him pass, and breathed a sigh of relief and accomplishment–it’s always amazing to come face-to-face with big wildlife on a trail. We breezed into Two Harbors, grabbed some beers and enjoyed the ocean breezes. The open mountain tops had been pretty intense in the sun, and I pity anyone who hikes the TC in the summer. Dad handled the logistics in Two Harbors, and we picked up the key for the campsite at Parson’s Landing. Then we made a wonderful decision that changed our hike for the better–we decided that, instead of hiking to Parson’s, we would kayak! 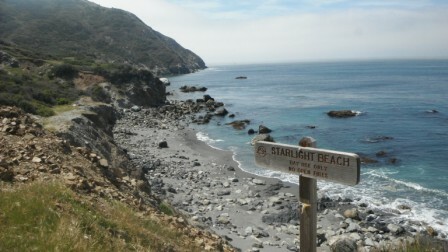 We could stick to the coast and paddle to Parson’s, then hike the last section to Starlight Beach in the afternoon. We made arrangements with the kayak rental shop, which was very easy, very laid-back, and happy to facilitate. We then snagged a good spot in the Two Harbors Campground overlooking the Pacific. Another night, a few beers, a fire, and excitement for the paddling on the morn. We woke early, and found our kayaks all ready to put out into the Two Harbors bay. We wrapped our packs in garbage bags, changed into shorts, and shoved off into the blue-green water. Seals ghosted our way past the moored boats, their heads surface for a moment then darting under when we got to close. The paddling gave us a whole new perspective on our journey, from the ocean looking in instead of out. It took us around two hours to slowly pass all the small islands and alcoves on the north side of the island. Finally, we rounded the last outcrop, which sheltered Parson’s Landing, and the actual motion of the open channel began to raise and dip our kayaks. We battled against this last section and coasted the waves onto the beach. We were the only souls at Parson’s Landing–it was desolate yet wonderful. Advertisement for kayaks, for sure. We had a great site on the beach, and the key we had (thankfully!) grabbed in Two Harbors gave us access to our water and firewood. We set up our tent, ate a satisfying post-kayak lunch, and then headed out to conquer the last section of the Trans-Catalina. The hike from the beach rose quickly, and we saw another bison slowly cruising the green landscape. The trail was really an old 4×4 road, and featured some very steep grades that presented great views but tired calves and quads. After a few miles, my Dad found a shady area to sit and rest, preferring to relax rather than continue the knee-jarring ups and downs for the next four miles. It was a smart move, as the trail only continued its jittery rises and falls. Finally, the trail rose one last time to a fog-blasted ridge dividing the north and south of the island, then descended steeply to Starlight Beach. I arrived to share the beach with a few gulls and a slow sailboat drifting past in the ocean. I dipped my hot feet in the cold water, rested a few moments, and then began the steep climb back to where Dad waited. 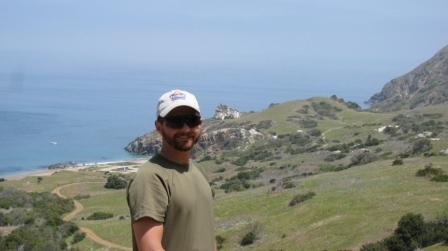 On the climb, I saw a bald eagle (which the Conservancy is trying to reintroduce to Catalina) and three Ospreys (actually the Marine Corps helicopters). My Dad and I made our way back to the beach, made dinner, lit a fire, and drank our last campfire beers–which were much more easily managed in the hold of our kayaks than in a backpack! The next morning, we had another surprise, as the put-in spot we had chosen for the kayaks was occupied by a sleeping buffalo! We had heard they often are seen standing in the waves, and this guy was camped out right on the beach. Eventually he got up to go scratch himself on a picnic bench, and we were able to launch our kayaks. I was sore from paddling the previous day, but the water was absolute glass, so we sliced along the coast. It was incredibly quiet in the lifting fog, just the sound of our paddles dipping into the water or the occasional seabird cry. Finally, the sun broke on the hills above Two Harbors, and we headed into the bay. 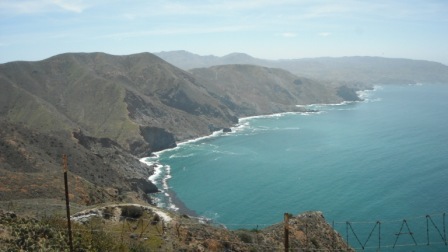 We beached our kayaks, changed our clothes, and celebrated our non-conventional completion of the Trans-Catalina Trail. The ferry over to Long Beach came, and my Dad and I had a beer while we watched the island disappear behind us. It was a great excursion, and I owed a great deal of thanks to my Dad for putting it all together. We had a great time–almost luxury backpacking with beer and fires every night. But it wasn’t just the wonderful views and wildlife encounters–good company makes a great hike. So thanks so much, Dad–I can’t wait till we’re out backpackayaking again! Awesome trip and time very well spent – where it matters. Thank you for the title of your blog! I think I’m making Catalina my next camping spot! Love it. Very nice. Now that’s living! Thank you all for your comments! It was an amazing trip–I highly recommend it, though shoot for early season. Summer might be scorching on those hills, and definitely less green! The kayaks we rented were from Two Harbors Dive & Recreation, if you want to do what we did.